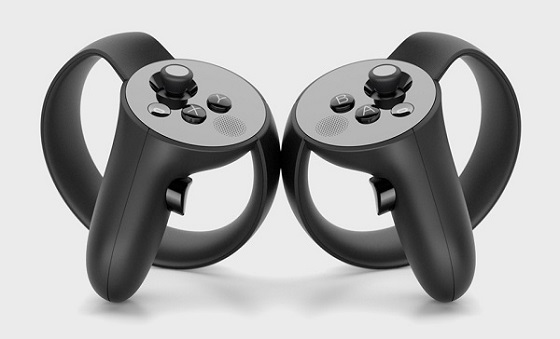 Launching at the same time as the Oculus Rift Touch, Sports VR Experience appeared to have a handful of different sports which could be selected from the main menu. This "menu" was presented as a curved desk around the player with an object from each sport displayed, along with a start button (or something to that effect). I unfortunately don't remember which sports were available besides American football and hockey. This demo was for hockey, and to begin, I picked up the hockey puck on the desk by moving my motion-tracked hand, grabbing with the Touch controller's triggers, and then placing the puck inside a hovering hologram which held it in place. I was then instructed to punch the start button by my real life attendant. I briefly considered that I would hurt my hand punching a table before remembering that I was actually in an empty room, so I bopped it with no small amount of satisfaction. The game itself was primarily goalkeeping. With one hand you could control your hockey stick and, with the other, your big goalie glove thing (I'm not a sports fan, clearly). The player's movement is limited to turning their head and moving their hands, and so you're mostly just sitting in the goal and watching the other team approach and pass with the puck so that you can block with either hand when they shoot. One minor feature was that the right controller would rumble slightly when your stick made contact with the ice, making it a bit more immersive and easy to tell when your stick was low enough to block pucks on the ground. After enough successful saves, you/the camera fly down to the other end of the rink to go for a timed shot against the other team's goal. Each time, the puck flies at you slowly down a colored meter and you have to swing the stick with good timing and force to make a shot attempt. Another part of the gameplay is trying to be the first to slap the puck when the ref drops it. For some reason, I had a lot of trouble with the timing on this. The game instructed me to swing as soon as the puck hit the ground, but I always ended up hitting straight through it and then hitting it backwards as I moved the stick back to try again. After doing this, control went back to the goalie and it didn't really seem to make much difference whether I hit the puck first or not (perhaps it gave me points at the end of the game?). After a timed match finishes, the score is displayed and unlockables may be unlocked. In the case of the demo, the ability to start fights in hockey was unlocked. At certain points, this could be done by making the motion to throw down your gloves and then swinging at your opponent with closed fists (pressing the triggers on the controllers). It was possible to do jabs, uppercuts, and punches from the side, as well as to block the opponent's punches. However, I found that if you punched fast enough, the other guy would never even get the chance to attack (but it's worth noting that demos are often made easier for the sake of demonstration). I also experienced one game crash while playing this demo, and it was at a time when nothing in particular was happening. It seemed that this was a known glitch though and I was assured that it would be fixed by launch, of course. Overall, I wasn't blown away by the demo by any means; the graphics and controls were functional, but it felt like merely a sequel to Wii Sports more than anything. That said, it was still fun enough to play a few times and the unlockables and other modes would extend the replay value somewhat. It seemed more like the sort of game you'd download to try a few times and then have your friends play, rather than spend lots of time on it yourself. So, Sports VR Experience - Not bad, kinda fun, but not outstanding. The last thing I did at E3 was wander around the smaller booths on the fringes of each hall. As I did, I was lured in by a woman promising me a virtual vacation with guided relaxation and only a five minute wait. I actually do have generalized anxiety (though I wasn't feeling so bad at that moment) and I was looking for a comfy place to rest my feet, so it seemed like the perfect thing to try. 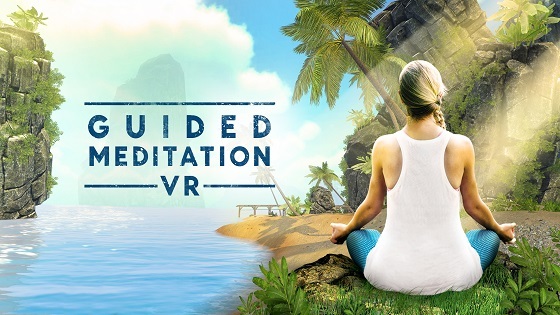 Guided Meditation VR featured four different relaxing locations: a Japanese shrine, a tropical beach, a snowy mountain, an "enchanted" forest, and a desert. Each location also had options for the kind of relaxation to try (I chose the one for anxiety, which was the first one I happened to select) and whether or not to have music. The time each session would take was also listed. I chose the forest environment and, after a short introduction, I was seated in scenic area where I was able to look around at the scenery on all sides. Although I didn't try it because I was afraid it would interrupt my relaxation, each of the four environments also had multiple meditation locations that could be switched to with a tap to the side button on the headset. Apparently, if I had done this, I may have been able to see a small Easter egg: a rabbit hopping by. Obviously, since this is for Gear VR, the device isn't powerful enough to handle incredible graphics, but you're supposed to be meditating and relaxing, not focusing on the graphics anyway. I actually found myself wanting to close my eyes to relax even further, which would have made the whole VR thing kind of pointless, but I stuck with it and watched the scenery instead. Oh, also, the app and device could measure your heart rate before and after the session to see if it helped you relax at all. My heart rate actually went up slightly, but it wasn't really a significant amount and it was only because my heart rate was fairly low to begin with.